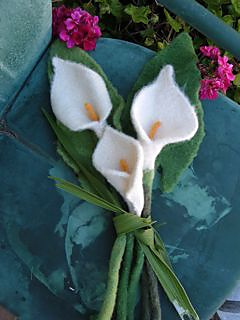 The Calla Lily and its leaf are amazingly life-like and make one-of-a kind bouquets. 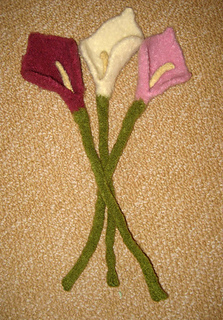 The flower is knit in one piece, starting with the I-cord stem and ending at the tip of the flower. 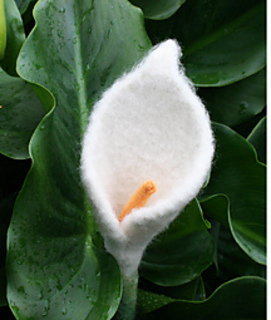 The stamen is a thin yellow I-cord knit into the flower’s center before the piece is felted. 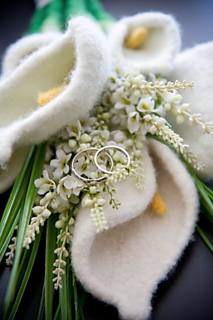 The large leaf gains its wave-like edging with a ‘tuck’ knit in the center.